There is a small tan-yellow subpleural granuloma in the mid-lung field on the right. 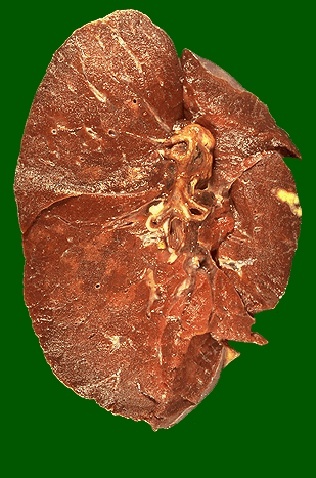 In the hilum is a small yellow tan granuloma in a hilar lymph node next to a bronchus. This is the "Ghon complex" that is the characteristic gross appearance with primary tuberculosis. In most persons, the granulomatous disease will not progress. Over time, the granulomas decrease in size and can calcify, leaving a focal calcified spot on a chest radiograph that suggests remote granulomatous disease.